Four minutes of merman-in-bathtub action. I have to admit that I was a little disappointed when the Crunchyroll player loaded and I saw that this was a short as opposed to a full-length episode. Also, the only thing the episode had time to do was set up the basic premise. However, that's pretty much all you need to see to know whether or not this short will catch your interest. 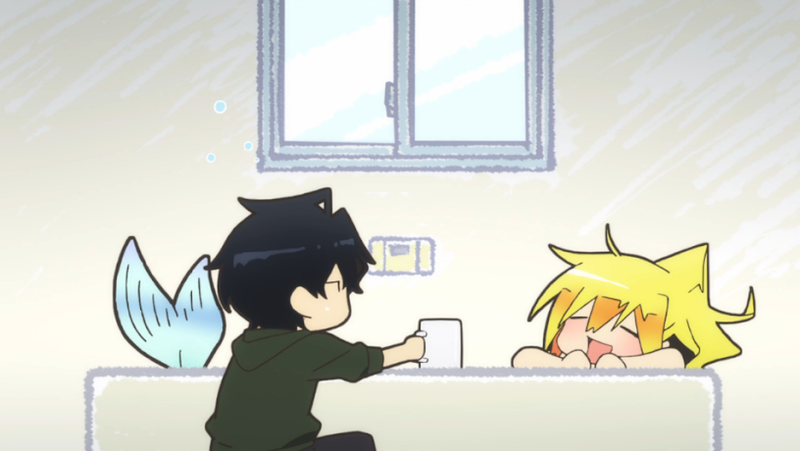 The two main characters are Tatsumi and Wakasa, who are now living together after Tatsumi rescues a beached Wakasa from the riverbank. However, "living together" doesn't completely describe their strange arrangement. Since Wakasa needs to stay in the water to live and hates the dirty river where he came from, he refuses to leave Tatsumi's bathtub. From that setup, it's implied that the rest of the show will be a comedy. And that's pretty much it. The animation is a bit more polished than most short anime, coming out on a level similar to a full-length TV anime episode quality-wise. The character designs also give it a bit of originality, with their impossible-in-real-life anime hair serving as an interesting point of connection between the average (Tatsumi) and the supernatural (Wakasa) so that they don't look strange in the same frame. While I'm not sure how the comedy will play out (since that's where I'm assuming this show is going), the interesting premise and the short runtime make this an easy show to commit to. Images from Crunchyroll.com. This post is also available on OASG. I was also surprised that this turned out to be a short and not a full length series as I expected after reading about it on Anichart. The main reason that I decided to check it out in the first place is that it sounded so absurd, that I had to see it for myself. But like you said, being the first episode, it was mostly there for setup for the premise. I will probably continue to watch it since the episodes are so short though. Both Kokkuri and Orenchi are based on 4-panel manga, yet Kokkuri gets full 30-min episodes. I wonder why. Have you watched anything else yet? Choose wisely, there's only enough room for 1 guy in the bathtub. Same here! The premise sounded so silly that I was sure that it would be a full-length episode to explore it... but I guess it didn't need that much time after all! Four-minute episodes makes it easy to decide whether or not you want to keep watching it though, since it's not too bad of a time commitment. Good point. Kokkuri worked pretty well in it's first episode, though. Maybe there's just a lack of content for this one? So far I've seen the Fate/stay night reboot, Kokkuri, Akatsuki no Yona, Denkigai (I might drop that one), and Chaika. I still need to watch Parasyte and the Psycho-Pass sequel. And merman!Haruka can have my bathtub whenever he wants.